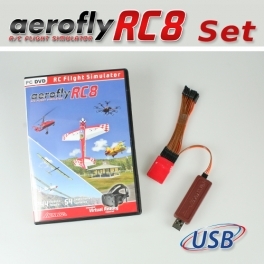 The legitimate follow-up to the famous aeroflyRC7 is completely consummated with great new models, fantastic new 4D sceneries, innovative technical highlights and many new features. 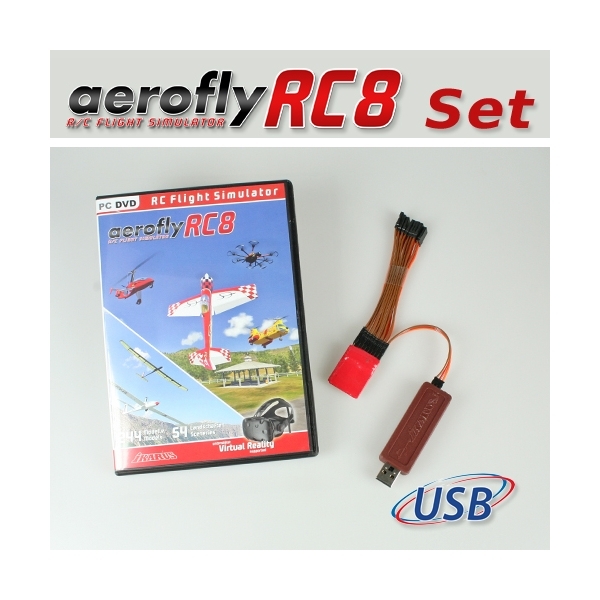 Here are just some of the highlights that make up the transition from the RC7 to the aeroflyRC8. Helis, Scale, Jets, Glider, Aerovatic - all aspectsof RC model flying! The IPACS developers makes a perfect job and proudly presents a technically feasible up-to-date RC simulation. On the IKARUS-Webseite you`ll find all features, the new models and details about the VR-Technologie. The Single-Line-Converter allow to fly wireless with any 2.4 GHz or former MHz receiver. You can transmit up to 8 channels to the interface. Via this USB interface you also can connect your own Graupner/HoTT receiver via your own GraupnerHoTT radio with the PC. You can transfer up to 12 channels and freely select your control mode 1 to 4. Only for VR mode: video card with 4 GB.